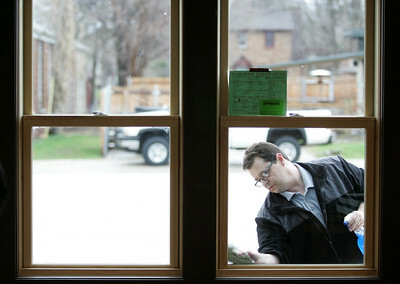 H. Rick Bamman - hbamman@shawmedia.comMarengo fire department Chaplin Jeff Hammer cleans windows at the new station on Main St. in Union. The remodeled facility will be staffed 24-7 365 days a week. 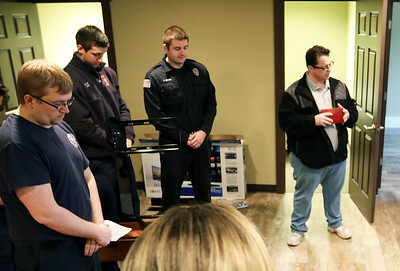 H. Rick Bamman - hbamman@shawmedia.com Marengo fire department Chaplin Jeff Hammer (right) leads the prayer and bleesing of the new station on the first day of operations on Monday, April 13, 2015. 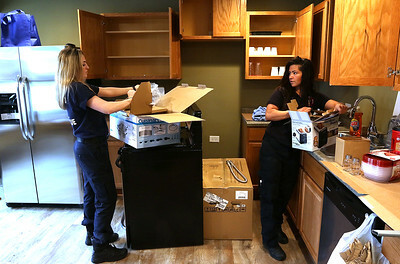 H. Rick Bamman - hbamman@shawmedia.com Marengo fire department EMTs Nicole Weiner (left) and Meaghan Pfeiffer unpack supplies for the new kitchen of the Rescue District station on the first day of operation on Monday, April 13, 2015.